Over 70,000 products to choose from. 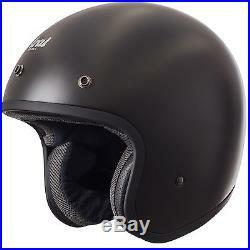 Arai Freeway Classic Frost Open Face Motorcycle Motorbike Crash Helmet Black L. The Freeway Classic from Arai Helmets. A classic and vintage style motorcycle open face helmet from Arai that offer a little bit of luxury and class! This has the basic Arai outer shell and is therefore sometimes referred to as Standard Fibre although it actually is Super fibre. Super fibre provides more comfort than other shell materials, yet is still strong and lightweight. Your item will be professionally & carefully packed and despatched in a timely manner. If you change your mind. If you have simply changed your mind about any item ordered and you wish to return it, then you can do so provided you inform us of your decision within 30 days of receipt. If your items are faulty on arrival, you should inform us as soon as reasonably possible. We are not responsible for the loss or damage of items during their return. Return address M&P Direct Ltd. Phoenix Way, Garngoch Industrial Estate, Gorseinon, Swansea. We’re here to help. Our aim is to enhance your biking experience by making sure that we have the products that you want, when you want them. With some staff having over 25 years experience and a state of the art ordering system we want to give you peace of mind in knowing our aim is to put you on the road and keep you there. The item “Arai Freeway Classic Frost Open Face Motorcycle Motorbike Crash Helmet Black L” is in sale since Wednesday, April 13, 2016. This item is in the category “Vehicle Parts & Accessories\Clothing, Helmets & Protection\Helmets & Headwear\Helmets”. The seller is “m_and_p” and is located in Swansea, Wales. This item can be shipped to United Kingdom, Ireland.